Thank you for subscribing to Potashcorp Field Reports Newsletter! Reap more of what you sow. Potassium levels are declining. 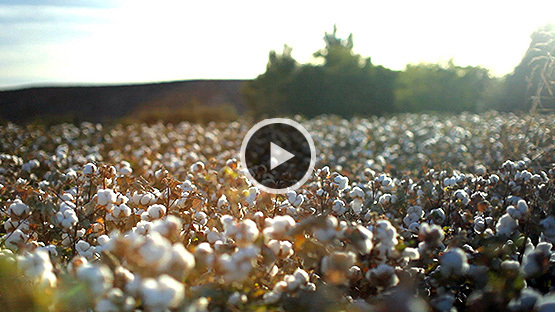 Are your fields protected? Thanks to better genetics and improved management practices, growers areenjoying consistently higher yields. But what may seem like cause for celebration could actually provide growers with reason for concern. Though higher yields demand increased nutrient replacement, many growers are still relying on traditional fertilization strategies. The result? An alarming decline in soil potassium levels — and a serious threat to Midwestern growers' future yields. Potassium removal has been consistently outpacing replenishment, presenting growers with significant long-term risks. Even with Uncertain Commodity Prices, Skimping on K Is Probably a Bad Idea. With the ever-changing domestic and global commodity markets, it's a stressful time to be a grower. 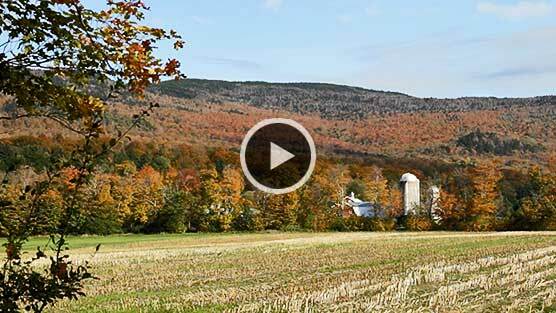 It's anyone's guess where prices will be next month, let alone next spring and fall. 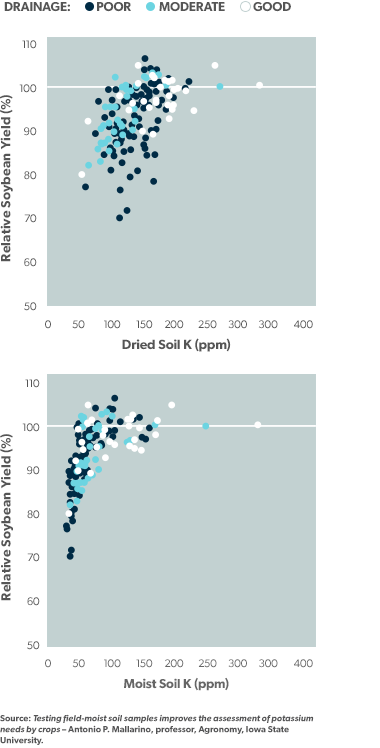 Though taking the wait-and-see approach may seem logical, researchers and agronomists agree that skimping on potassium, especially if soils are below the critical level, is a bad idea both scientifically and economically. If you're below the critical level, it pays to invest in K.
Let's hypothetically say we end up with $9 beans, depending on your soil test level. there's still money to be made by applying potassium. 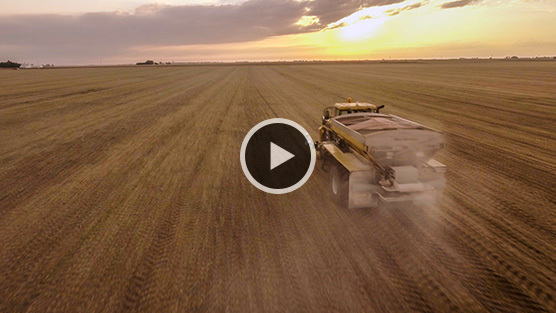 The average person may still think of the Great Plains as rolling fields of wheat. But growers in the region know that today, it's all about corn and soybeans. What many growers may not know, however, is that the natively high potassium balances that have led to record yields are now dwindling – and in some cases, have actually fallen below the critical level. 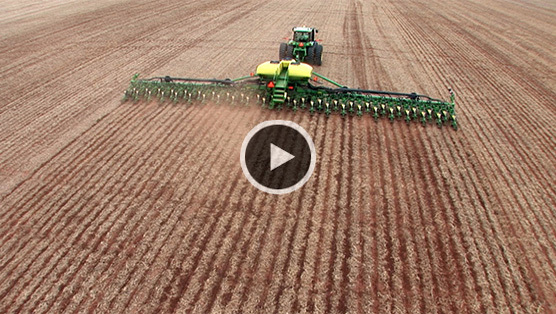 In this video, Great Plains experts detail the extent of the region's agronomic shift and emphasize the importance of applying enough potash to keep pace with exceptional yields. NDSU Raises K Critical Level in Certain Soils: Findings May Help Midwest Growers Earn Thousands More. The term “smectite” probably isn't something most growers have heard before. It's a mineral commonly found in soils throughout North Dakota and the Midwest. According to a groundbreaking NDSU study, it may also be one of the biggest factors impeding potassium availability — and grower profitability. That's because by their very nature, smectites “hold” potassium. Dr. Dave Franzen and his team determined that in order to account for the impact of these minerals, the potassium critical level should be raised from 150ppm to 200ppm in highly smectitic soils. This change may help a third of the state's corn-growing region earn tens of thousands more each year. And may help many across the Midwest do the same. Majority of funding for research provided by the North Dakota Corn Council. Research shows if your soil has a 3.5 or greater smectite-to-illite ratio, and you have a soil test less than 200ppm, you'll get an economic return from the addition of potash. Highly smectitic soils make up a third of North Dakota's corn-growing region and constitute hundreds of thousands of acres across the Midwest. New Study Shows Key Growing States Facing a Potassium and Phosphorus Deficit. In a recent update to the industry’s only nutrient balance analysis, Dr. Mullen reveals that over the last 40-plus years, nutrient removal trends have outpaced consumption across much of the country. 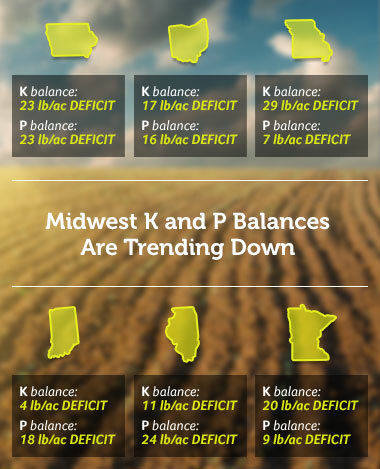 As a result, many key growing states now face a K and P balance trend deficit. The record yields many growers have recently enjoyed may make the warning signs appear less urgent. However, Dr. Mullen emphasizes this is an issue to be mindful of today, cautioning growers that if these trends continue, future yields and income-per-acre could be compromised. Click here to explore our interactive state-by-state nutrient trends map. Years of not meeting K and P demands may soon catch up with growers. Why We Should Start Calling It “NKP”, not NPK. Traditionally, agriculture’s top three macro-nutrients have been referred to as “NPK”. So it comes as no surprise that many growers place the value of each in the same order. However, leading soil fertility expert Dr. Carrie Laboski is challenging that thinking. Her game-changing research at UW-Madison suggests that if P and K levels are both testing low, prioritizing potassium ahead of phosphorus is the better financial choice, for better net returns. 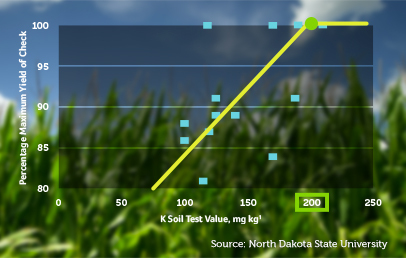 Research indicates that on soils testing low in K and P, potassium application was more effective in boosting yields than phosphorus. National Testing Lab Finds More Soils Testing “Low” or “Very Low” for Potassium. On a yearly basis, Rock River Laboratory analyzes hundreds of thousands of soil samples from 22 states around the country. 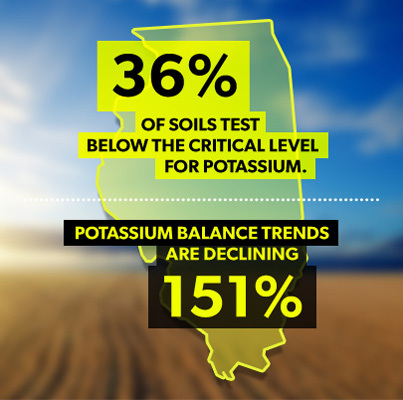 The one major trend that jumps out in the lab’s analyses is a significant decline in nationwide soil test potassium. In the last five years alone, the number of samples testing “Very Low” for potassium has dramatically increased – as much as 8% in some states. 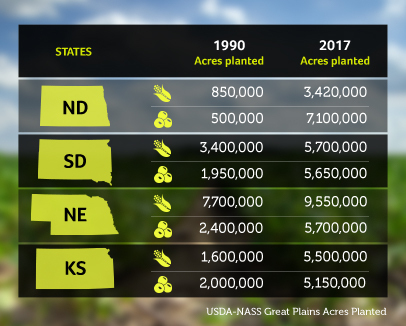 Lab Director Dustin Sawyer provides insight into what he’s been seeing and the financial implications to growers if declining K trends continue. Over the last decade, there has been a significant decline in soil test potassium levels &dash; an alarming trend that may impact profitability if not addressed. 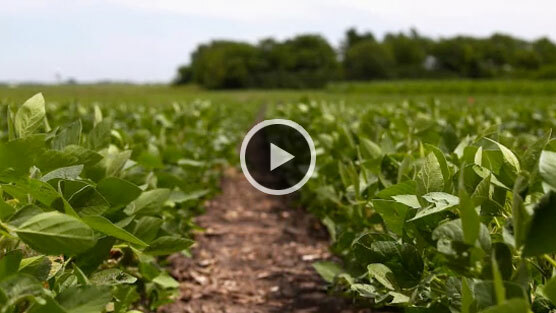 Three Economic Reasons to Make Sure Your Beans Have Adequate K.
As commodity prices continue to fluctuate, growers are planting more soybean than ever before. It makes sense. The prospective net return per acre for beans is the best it’s been in decades. 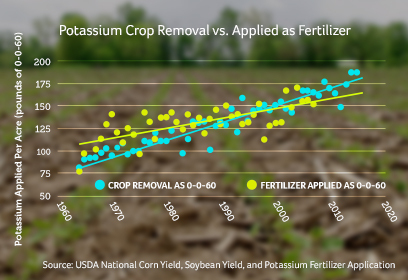 However, the often overlooked component to profitability is adequate K. Soybeans not only remove more potassium from the soil than corn, removal rates have increased due to improved yields. That means the traditional K-rate growers have been applying to their rotations isn’t cutting it anymore. Dr. Carrie Laboski and Dr. Heidi Johnson have been seeing this issue crop up far too often in their home state of Wisconsin. 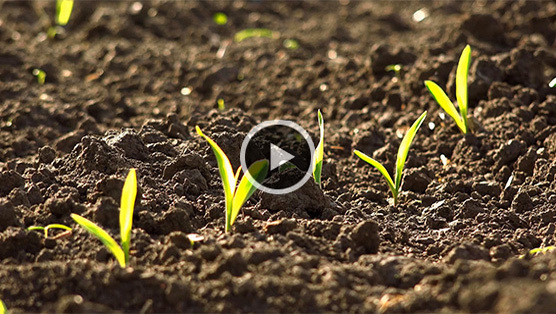 In this video, they detail the importance of potassium to plant growth, and financial growth. The 4Rs provide a really nice framework to achieve cropping system goals. The right source. The right rate. The right time. And the right place. However, UW-Madison soil fertility professor Carrie Laboski believes a “5th R” should take priority – the “Right Data”. It’s really the first step in developing a plan that works best for the environment and a grower’s bottom line. 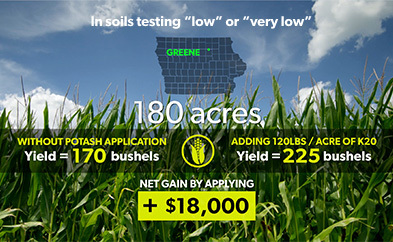 Coupling tissue testing with soil testing can help yield big returns at a relatively small cost. 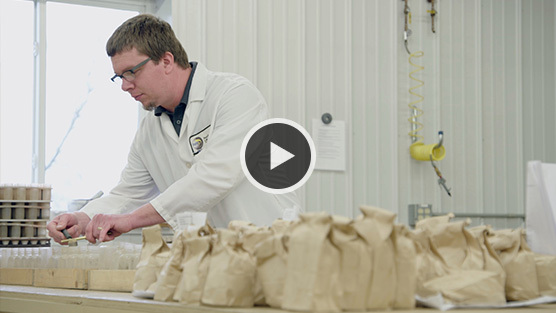 Hear more from Dr. Robert Miller on how tissue testing can help growers assess and optimize their soil fertility programs. 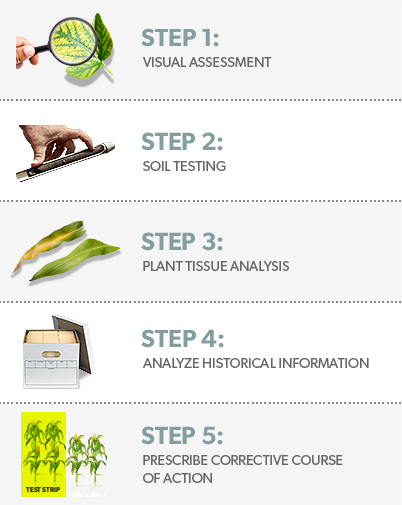 The ear leaf tissue K test reveals what a soil test can’t. Soil tests indicate if your field has adequate potassium levels, but the tissue test can reveal if you have adequate potassium available to the plant during peak uptake. 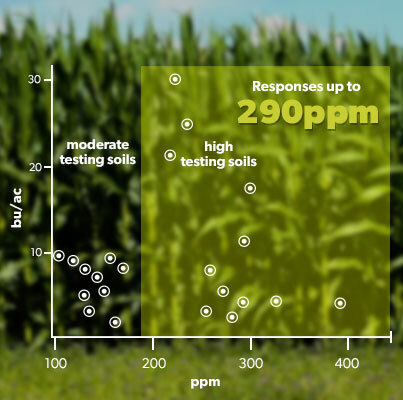 Midwest recommendations often suggest growers need not apply potassium if soil test levels are above 170 ppm, but recent research has shown that application could pay off in a big way. 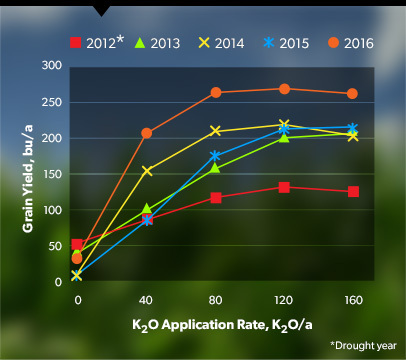 Results from Dr. Robert Miller’s KRx project revealed that significant yield responses can be achieved from application in soils generally considered to have “adequate” soil test potassium levels – meaning potassium may be much more limiting than many growers think. The research revealed yield responses to applied K fertilizers on soils as high as 290 parts per million, which far exceed what the land grant university critical values are. 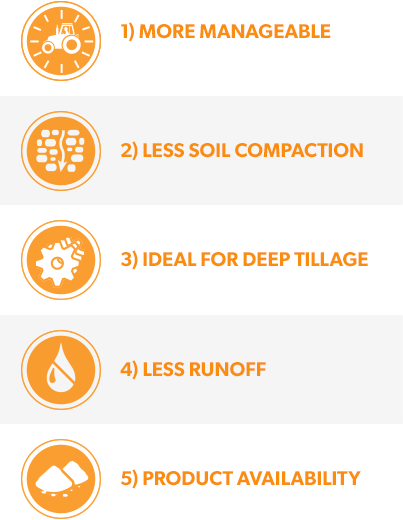 Six Soil Fertility Considerations for Spring. 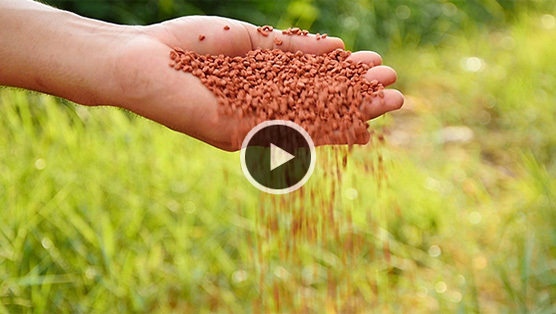 When preparing for spring planting, one of the most important things a grower must consider is soil fertility. Dr. Robert Miller shares six considerations that growers should keep in mind this spring to maximize their yields and profits in 2017. The last two years have been phenomenal for crop production. 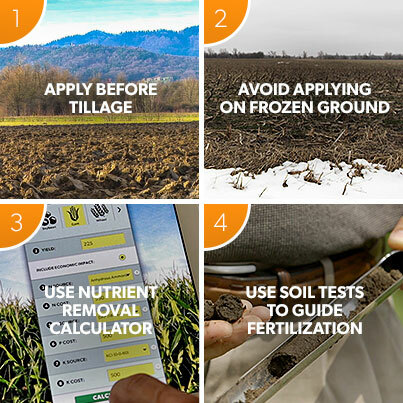 Keep the momentum going early by following these three basic, yet very important, planting tips. 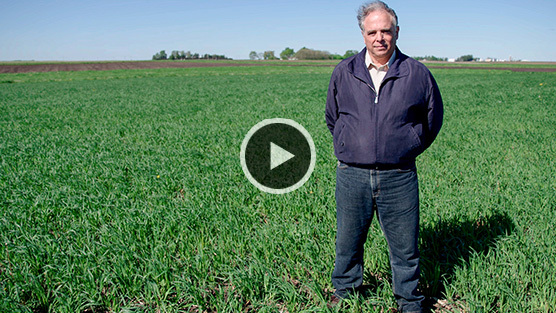 Why Investing in Only Nitrogen this Spring, May Cost You Dollars this Fall. 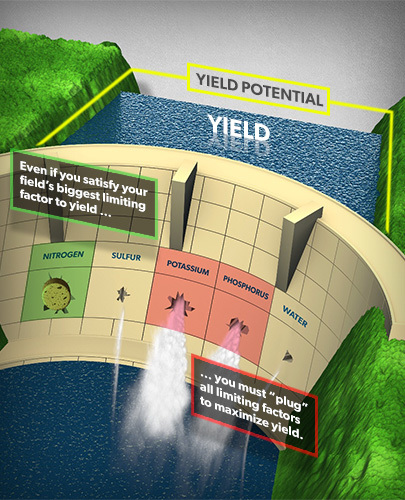 Many producers follow Liebig’s Law of the Minimum, which states that maximum yield is dictated by the most limiting nutrient. 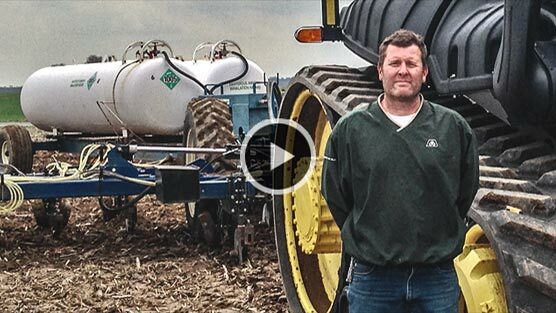 For Midwestern corn growers, that nutrient is often nitrogen in the spring. The problem is, many misinterpret Liebig’s Law to mean an investment in nitrogen is all that’s needed to maximize yield – but that’s only true if all other nutrients are supplied at 100% sufficiency. In this video, Dr. Robert Mullen points out the importance of not ignoring other limiting factors like potassium. Because if your field is short on K in spring, you could be short thousands in fall. If all nutrients aren’t supplied to 100% sufficiency, yields will be lost. 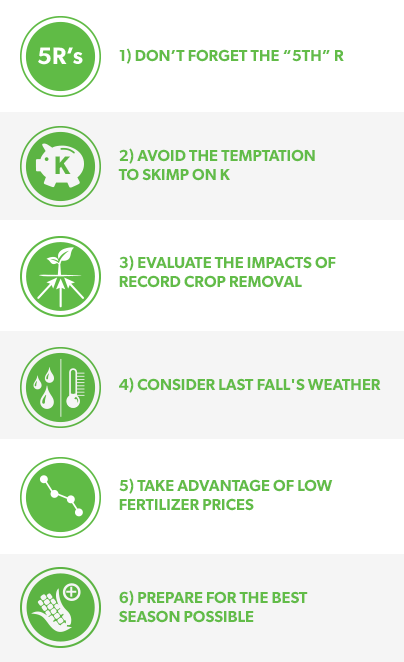 Whether this is your first year applying potassium in the fall or your 50th, these four tips will ensure you get the best economic return from your fertilizer investment. There may not be a big agronomic difference between applying potassium in the fall or the spring, but from an economic standpoint, fall application could yield the best results in more ways than one. 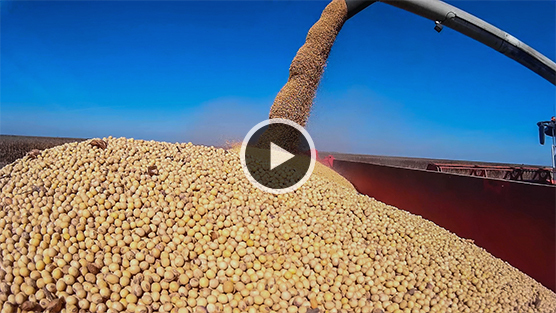 In this video, University of Minnesota’s Dr. Fabian Fernandez joins Dr. Robert Mullen in detailing the top five reasons why fall-applied potassium may make the most logistical, practical and financial sense for your operation. Are You Among the Many Who Need More K than Current Benchmarks Indicate? University-established critical levels have been instrumental in guiding fertilizer decisions to maximize yields. However, many of those critical levels were determined 10 to 20 years ago and, therefore, don’t take into consideration the potassium demand rates of today’s new hybrids, varieties and production practices. 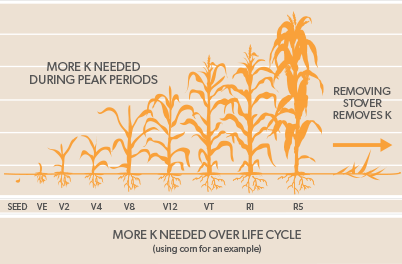 It’s important to assess your operation, what you grow and what your potassium needs are to ensure you apply the K needed this fall to maximize yields next fall. 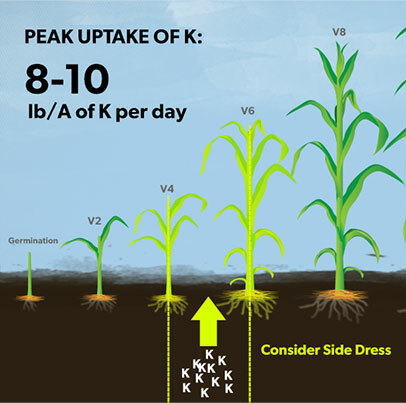 if you’re using new hybrids, varieties or practices, you may need a lot more k than you might think. 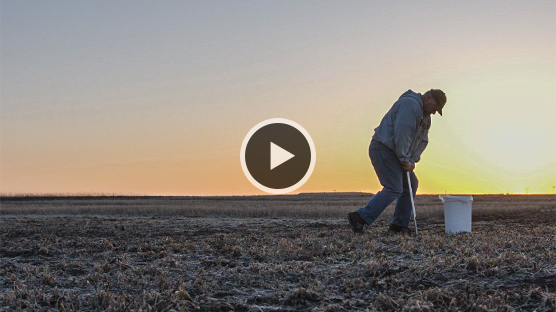 A New Reality Emerging: How Iowa State Is Setting the Bar for Fertilizer Guidelines. Many university-recommended fertilizer application rates have remained unchanged for years, but the work done by Iowa State’s Dr. Mallarino, known as the “Mallarino Model,” has many rethinking their recommendations. His research methods and results are proving to be a better reflection of what farmers are seeing in their fields, and offering a more accurate guideline to help maximize crop yield, fertilizer response, and ultimately profits. Revised recommendations support need for higher potash application rates. With Today’s Prices, Potash Is Key to Improving Margins for Cash Renters. Crop prices have been low all year and 2017 is shaping up to be the same. So it’s no surprise that growers are looking to save money this fall, especially cash-renters. Cutting back makes sense if you have high potassium levels, but if your field is testing “low” or “very low,” you could potentially miss out on thousands. 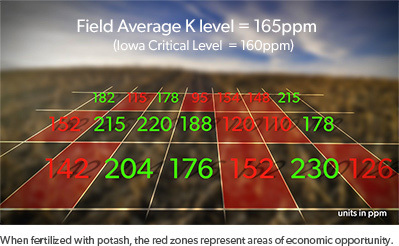 Iowa Certified Crop Advisor Tom Smidt explains how actually investing in potassium, rather than cutting back, makes the most business sense – even for a one-year, cash-rent. Tom Smidt illustrates the profitability of investing in potash, even in a one-year, cash-rent situation. 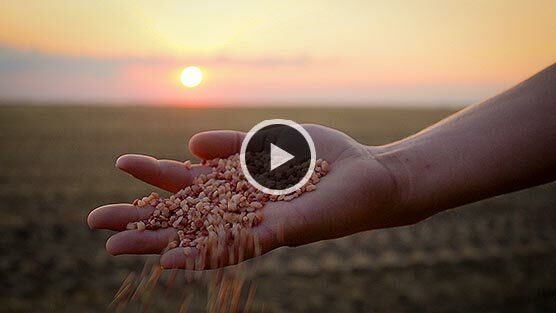 If your crop is showing signs of discoloration, stunted growth or poor health, there’s a proven five-step process that’ll help get your crops and your profitability back on track. ROI Calculator 2.0: Accounting for Spatial Variability to Predict Financial Benefits of Potash. Introducing the eKonomics Return On Investment Calculator 2.0. It’s the industry’s first to incorporate spatial variability, which means it’s a better reflection of field-scale agriculture. 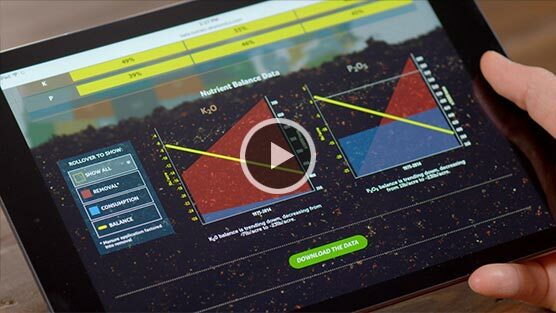 With margins being extremely tight, it’s a great tool to help you calculate, based on your soil test, if an investment in potash can improve your bottom line. 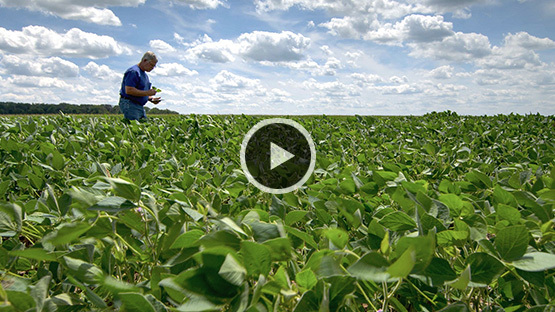 Managing crop inputs based upon an average soil test level is becoming a thing of the past. Today’s most successful growers account for the range of highs and lows (a.k.a. spatial variance) that comprise the “average”. So even if your soil test indicates your field is above the critical level, the cost of fertilizing the “low” areas is more than offset by the increase in bushels-per-acre return. 4R’s: For the Environment and For Profitability. 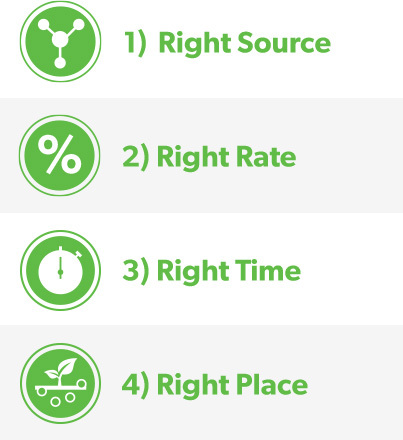 Many people think of environmental sustainability when they think of the 4Rs, but the truth is, they’re just as important to a grower’s profitability. 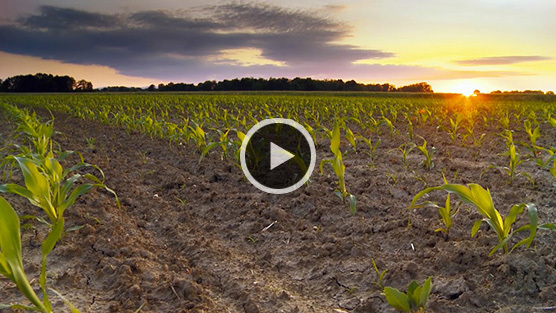 Illinois Certified Crop Advisor Dan Schaefer details how following these 4 guidelines can benefit both the environment and your bottom line. For Soils Testing Below the Critical, It’s Vital to Apply More Than Crop Removal to Reach Yield Potential. Using crop removal numbers is a wonderful tool to help guide the application of fertilizer. But as Dr. Robert Mullen points out, that method is only accurate if soils are at or above the critical level. Otherwise, application rates should compensate for “buffering” which can prevent crops from getting the nutrients they need to reach yield potential. 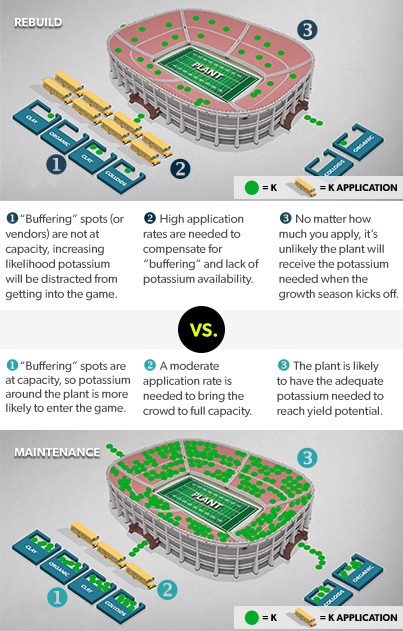 To ensure adequate potassium levels (a fan in every seat), the maintenance approach is the most effective. Experts Advise Illinois Growers to Focus on Potash in 2016. In a year with lower commodity prices, it may be tempting to cut back on potassium. However, as Illinois Certified Crop Advisors Dan Schaefer and Harold Reetz point out, that could be a huge financial mistake, especially if your soils are among the 36% below the critical level. 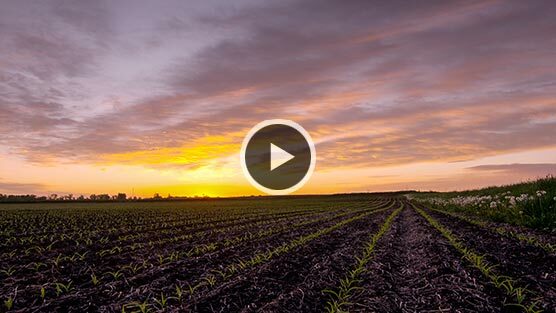 In this video, they detail how adequate potassium levels are key to maximizing profitability given today’s market conditions. 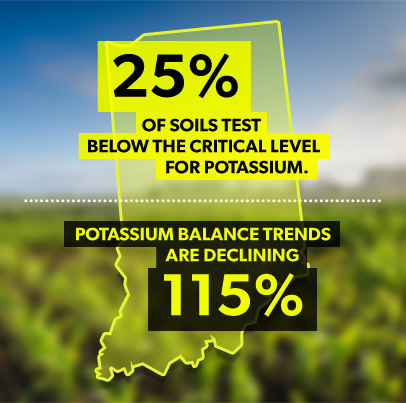 Three Factors Leading To Declining Potassium Balance In Indiana. Indiana producers are growing some of the best corn in the state’s history, but with 25% of Indiana soils testing below the critical level for potassium, it’s important not to get lulled into a false sense of security. 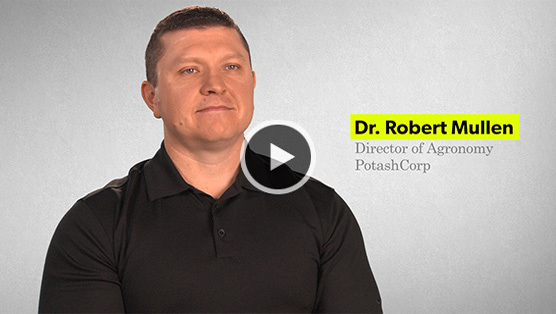 Certified Crop Advisor Steve Dlugosz explains the importance of potash to a grower’s profitability and the three pitfalls to avoid in order to maintain the proper potassium levels needed to reach yield potential. 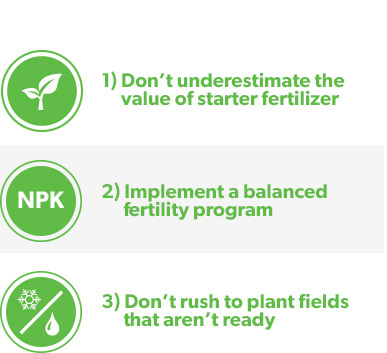 Three Lesser-known Advantages of Starter Fertilizers. 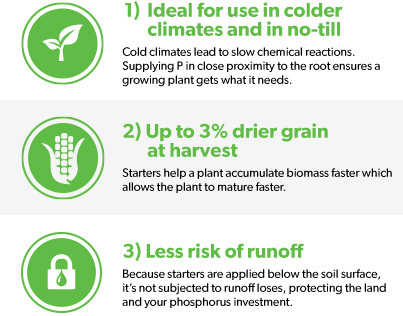 For many growers, starters translate into better yields, but as Dr. Robert Mullen points out, there area a number of other agronomic and economic advantages to applying starter materials this spring. How Starters Can Improve Your Bottom Line, Beyond Improved Yields. Top Ohio CCA confirms findings of new eKonomics nutrient balance analysis. The eKonomics nationwide nutrient balance analysis reveals a shocking decrease in potassium levels over the last thirty years. This may come as a surprise to some, but to Mike Dailey, 2012 Ohio Certified Crop Advisor (CCA) of the year, it only validates what he’s seen over the last three decades in the field. He and his fellow CCAs agree that this trend may pose the biggest threat to a grower’s profitability. Results may vary based on soil, weather, geographic and economic conditions. When you look at the many biological benefits of proper potassium nutrition in cotton, investing in K inputs is an intriguing proposition. But when you look at the financial benefits, especially on low K soils, it’s a no-brainer. 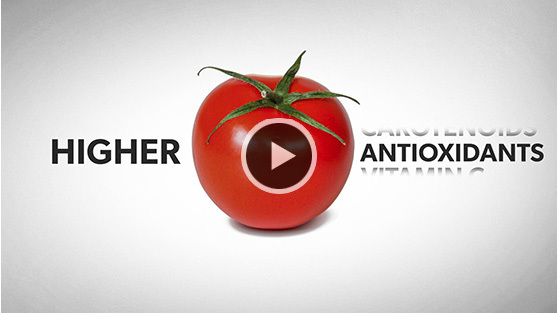 K Can Improve Overall Quality of Fruits and Veggies. Potassium does more than just help maximize yields, it helps maximize the quality and marketability of those yields. 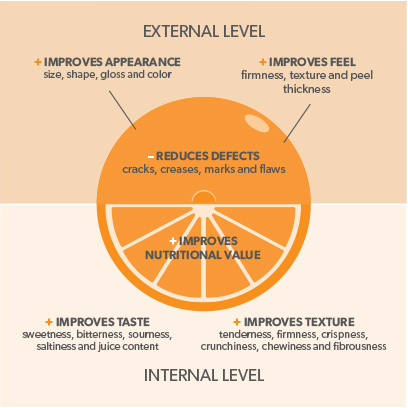 As Dr. Mullen points out, increased seed size, longer shelf life, thicker peels, increased sugar content, more vitamins, more carotenoids and more anti-oxidants can all be attributed to adequate potassium nutrition. Even with Lower Crop Prices, Investing in K Can Be Very Profitable. When crop prices soften, investing in potassium may not seem like a priority. But for growers deficient in K, it should be. The numbers indicate that in many cases, an investment in potassium will not only pay for itself, it may dramatically increase net earnings. How K can boost your yields and your bottom line. 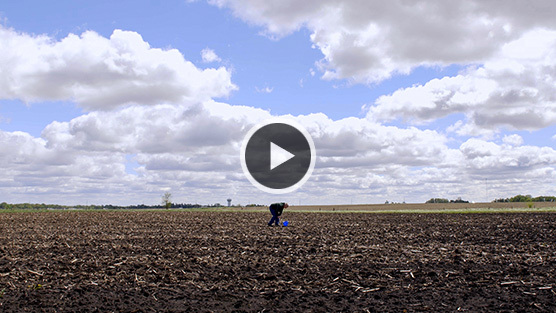 Dr. Fabian Fernandez, along with roughly thirty volunteers, sampled nearly 600 Illinois fields in 52 counties to determine soil fertility levels. 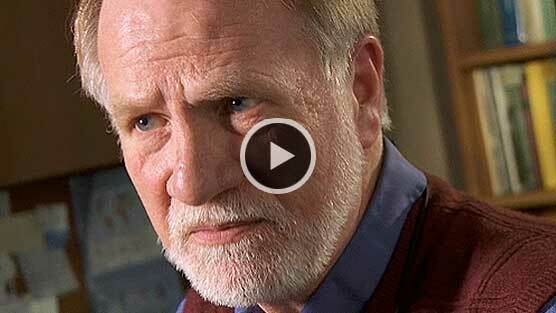 What they found was alarming. 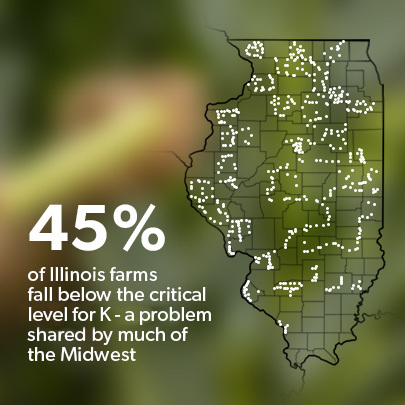 Nearly 45% of fields surveyed fell below the critical level for potassium. 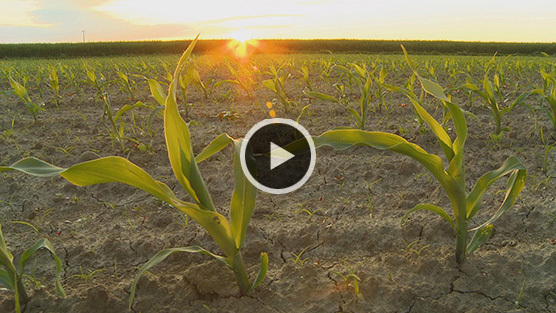 What’s more, Dr. Fernandez points out his findings highlight a problem most likely plaguing the entire Midwest – one that may dramatically impact spring development and fall yields. 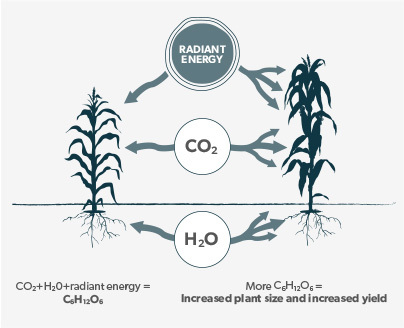 How K Can Help Maximize Photosynthate, and Ultimately, Yields. We all remember photosynthesis from our grade school science days, but the importance of this process can’t be understated. It is perhaps the single most important factor in the development of a plant, especially in spring. And potassium is the element that keeps it all running smoothly. 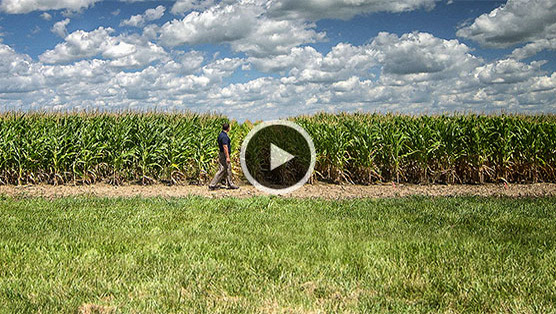 Listen to Dr. Fernandez talk nutrient application timing and starter placement methods, including their effects on yield. 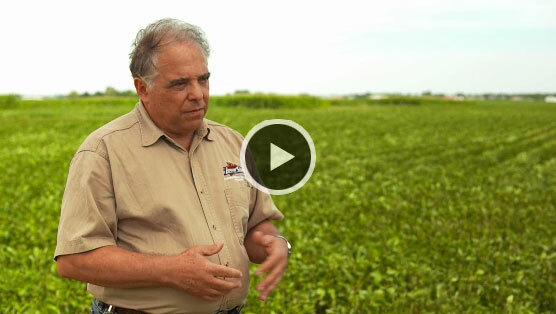 Dr. Mallarino, who specializes in nutrient management, talks about the conditions that make the most sense for applying starter in Iowa and the North Central region. 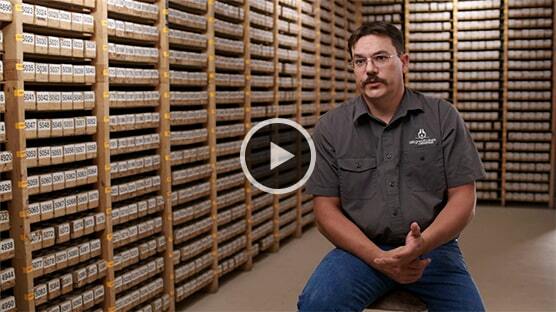 Hear from a seed sales rep on how using starters can limit your weather and soil condition variables, and why he recommends talking to your local input suppliers. 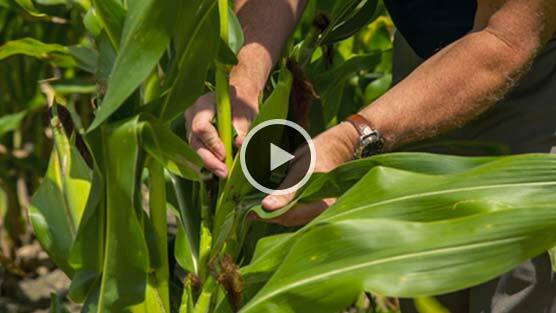 Learn why this fifth generation family farmer uses starters, including the benefits to his racehorse corn hybrids and how they’ve helped him increase his yields. Fertilization: Comparing The Maintenance Approach vs.The Sufficiency Approach. Virtually everyone in the industry agrees that fertilization is required when soils fall below the critical level for P and K. But that’s where the consensus ends. The real debate begins when determining a course of action for fields right at that critical level. Fertilize? Or not to fertilize? 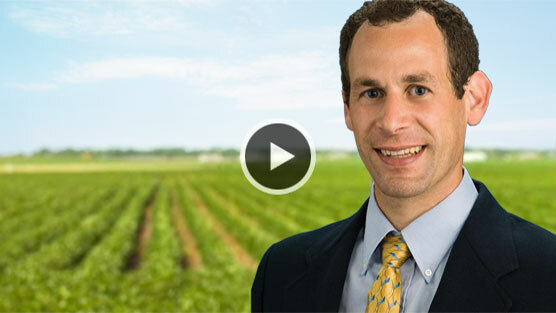 In this video, Dr. Robert Mullen explains the difference between the Maintenance and Sufficiency Approaches to fertilization and offers his opinion on what method he recommends to ensure farmers get the most out of their fields. Result: Nutrient application ensures the entire field is above the critical levels for P and K, thereby maximizing yields. Result: Although the field has an average at or above the critical level, some areas of the field may still fall below the critical level. Therefore, the farmer risks yield loss in order to save on nutrient costs. 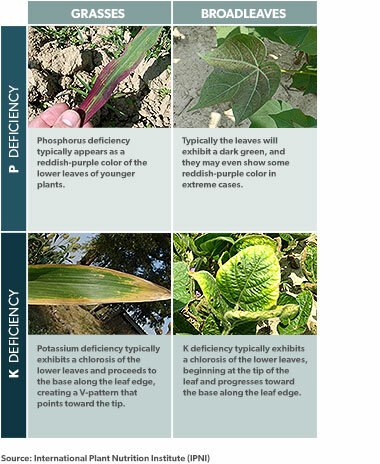 How to Recognize Nutrient Deficiencies Just by Looking. Assessing a soil for nutrient status in a laboratory can be a good way to determine whether it has the fertility needed to support optimum growth, but visual assessment of the crop can also tell you a lot about your soil. Being aware of what to look for can help you catch a problem before it impacts your yield and your bottom line. 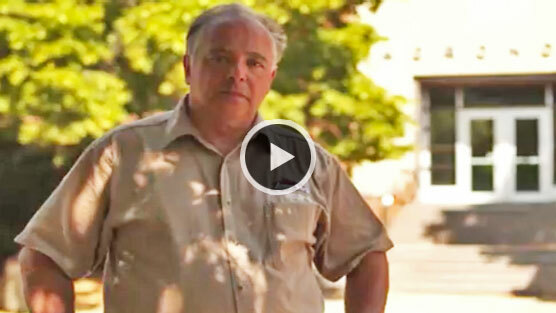 In this video, Dr. Robert Mullen reveals some of the most identifiable visual cues of nutrient deficiencies in both grasses and broadleaves. 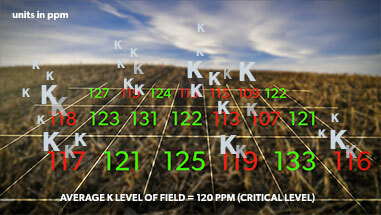 Think your crop might be deficient in P or K? Here’s what to look for. 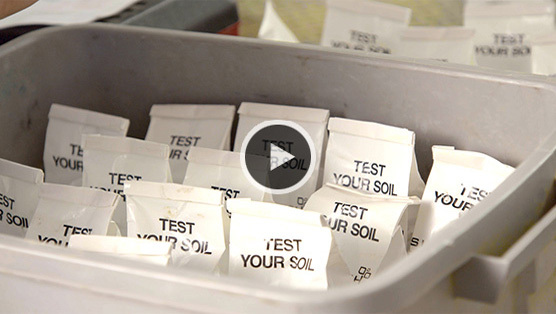 Testing for Potassium: Comparing the Dry Soil Test to the Moist Soil Test. For decades, the common method for testing soil for potassium has been to dry samples prior to analysis. However, research conducted by Iowa State’s Dr. Antonio Mallarino reveals testing moist soils may be more accurate when estimating the availability of potassium for crops and the need for fertilization. This eye-opening research may change how soil tests are conducted in the future, and may ultimately help farmers make better business decisions. Research indicates the Moist Soil Test may show better relationships between soil test results and yield response. Translation? the Moist Soil Test may be more accurate in determining how much potassium is in the soil. 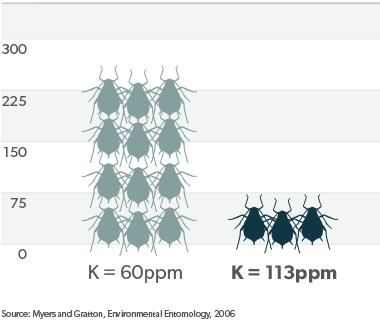 We all know how valuable K is in maintaining crop nutrition, but it may also help crops build up tolerance against pests and pathogens. 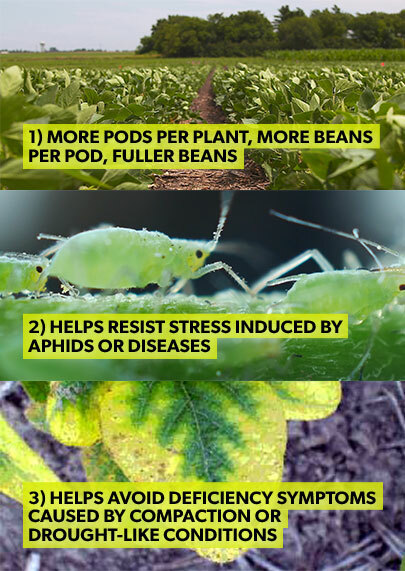 Studies show that K for plants works much like vitamins for humans in improving overall health - meaning K may not prevent plants from getting sick or infested, but it can drastically improve their resistance to fungi, insects, pathogens and nematodes. 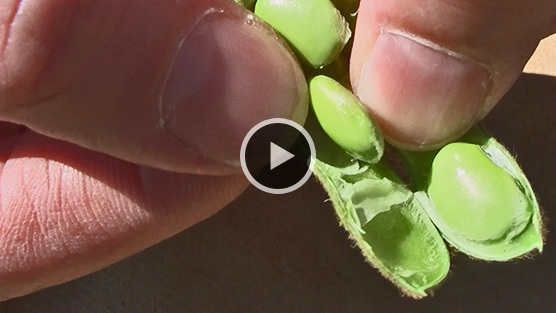 Robert Mullen explains how this boost in tolerance can help boost yields, and ultimately your bottom line. 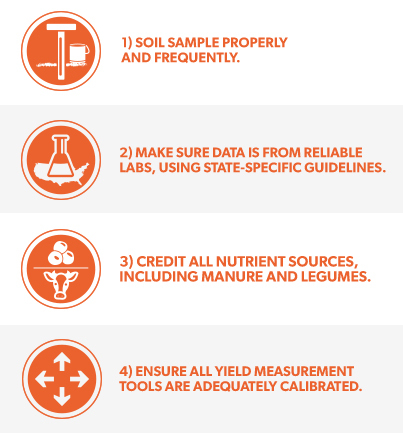 Soil sampling isn’t exactly everyone’s idea of a good time, but it is the single most important guide to the profitability of your fertilizer investment and crop production. However, soil analysis is only as good as the samples that are collected, so it’s imperative that proper techniques be used to collect them. 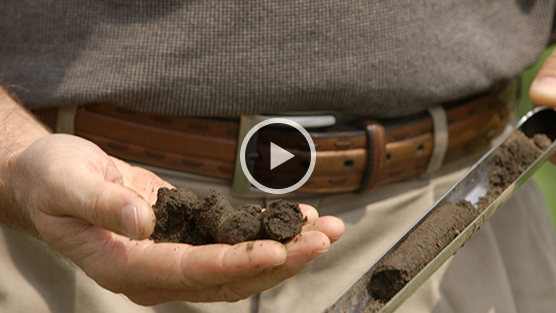 This video outlines the four most important tips to consider when soil sampling this fall. Think of the new eKonomics Nutrient Removal Calculator as the upgraded version of similar tools you may have used in the past. 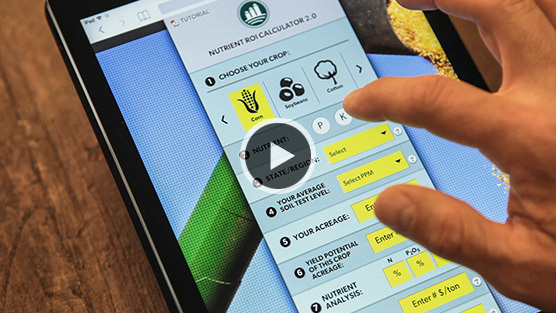 Like traditional calculators of its kind, simply enter your crop and your yield to determine the amount of N, P and K being removed from the soil – classified into two categories: “With Stover” and “Without”. 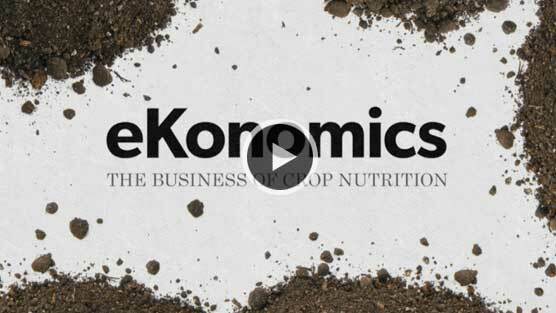 The eKonomics Nutrient Removal Calculator takes it to the next level with an exclusive “economic impact” feature. It reveals the dollar value associated with the nutrients being removed, making it easier than ever to determine how much to invest in fertilizer to maximize profits. Check out the video to see how it works. Fall Tips: Harvesting Stover Means You’re Removing Potassium...and Lots of It. The onset of bioenergy has created a wonderful opportunity for farmers to harvest and sell stover for use in cellulosic ethanol. However, there’s a catch. Recent research conducted at Iowa State indicates that the removal of stover will dramatically lessen the amount of potassium that’s returned to the soil. Translation? 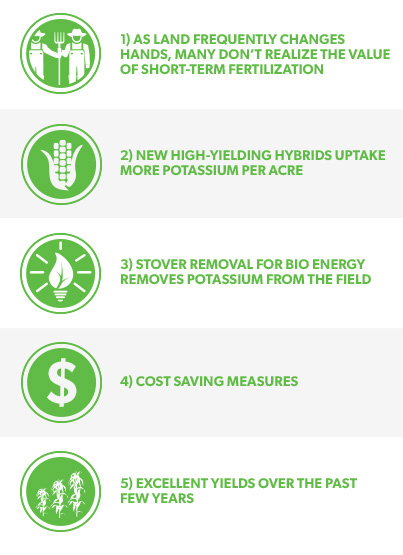 Farmers harvesting stover will need to invest in up to three times more potassium to maintain the optimum nutrient levels necessary for maximizing profits. 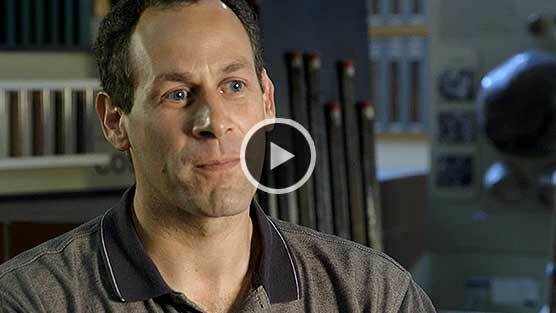 In this video, Iowa State’s Dr. Mallarino explains his research and findings. The amount of K lost from physiological maturity, to grain harvest, to residue is significant. Are Your Hybrids Getting Enough K? Due to biological advancements over the last 50 years, hybrid yields have reached levels never achieved. But with greater yields, researchers have found a significant drop in soil nutrient levels to near or below critical. Dr. Paul Fixen of the International Plant Nutrition Institute shares recent research on the importance of K to new hybrids. New hybrids have an amazing rate of absorption compared to older varieties. The past five years have been a turbulent time for the global economy, but agriculture has remained a sector of strength – in large part due to rising demand for commodities, higher crop prices, and above all, improvements in farm productivity. 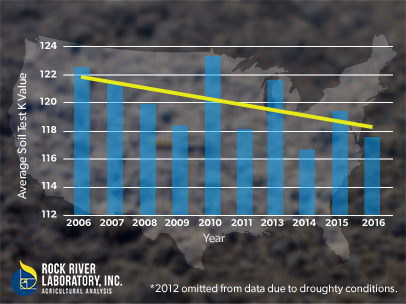 However, statistics indicate that productivity may drastically be impacted if soil test levels for phosphorus and potassium continue declining at their current rate. And with populations increasing and diets improving, the implications of continuing to draw down nutrient levels will become even more critical. 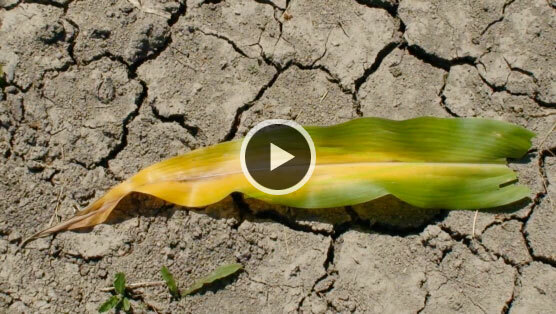 Prepare for Drought Conditions with Proper Nutrient Management. Results from a long-term P- and K- rate study on a corn/soybean rotation showed a dramatic response to elevated K levels as a means of combating drought effects on yields. During drought conditions, fields with elevated K levels,on average, achieved 80 bu/acre more of corn and 15 bu/acre more of soybean. Are You Among the Many Leaving Money in Your Fields? Thanks to advances in technology, farmers have consistently increased yields in the last 15 years. But fertilizer applications have remained constant, causing many fields to drop below the critical levels for P and K. What are the business implications to you? 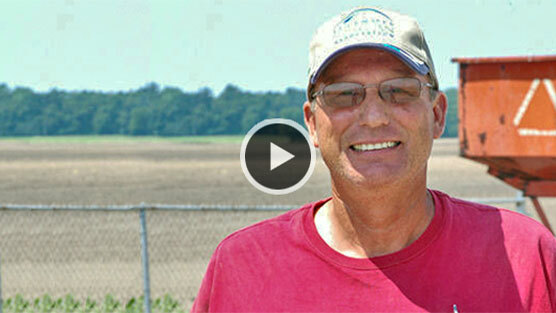 How Midwestern Farmers Can Achieve Thousands More in Net Profits in 2013. Dr. Robert Mullen uses an average size Iowa farm of 333 acres to illustrate how a sound investment in potassium could generate an economic return of $73/acre — which calculates to almost a $24,000 increase in net profit. See how this research could help improve your bottom line. Get the Most Out of Your N Investment with Improved K Nutrition. When most farmers think about potassium nutrition, they only consider the yield improvement they can achieve by making that investment. 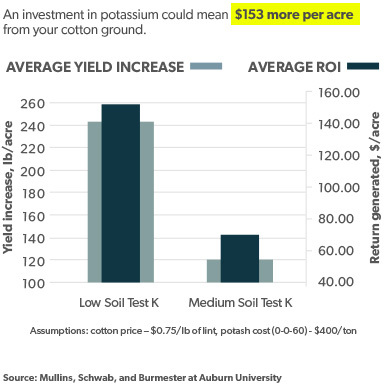 But as Dr. Robert Mullen points out, ensuring you have adequate potassium for your crops may also increase the return you get from your nitrogen fertilizer investment. Before you go, sign up to get notified the next time unique research like the one you just viewed gets posted. We hate spam as much as you, so we promise not to share your info. 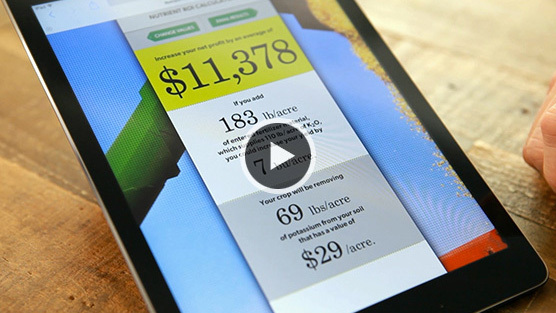 Congratulations, you’re one step closer to earning more income-per-acre. A confirmation email has been sent to your inbox. We’ll be in touch with future updates, but until then, if you have any ideas for content you’d like added to the site, tell us at: support@nutrien-ekonomics.com. Be the first to be know when new research or data about your state gets posted. Ours could be worth thousands. high when crop prices are low. Be the first to know when new research videos like the one you’re watching get posted to the site. Congratulations, you’re one step closer to earning more income-per-acre. A confirmation email has been sent to your inbox. We’ll be in touch with future updates, but until then, if you have any ideas for content you’d like added to the site, tell us at: support@nutrien-ekonomics.com. Want to download this video for use in a presentation or to post on social media? Success!The video is being downloaded. We’ll keep you updated when new research like the one you just viewed gets posted. Until then, if you have ideas for content you’d like added to the site, tell us at support@nutrien-ekonomics.com. You deserve to earn more. We can help. Get links to free tips, tools, calculators and research to keep you learning more and earning more in 2018.